Ana says goodbye to Sarah McCarry’s girls. Stand alone or series: The third book in the Metamorphoses series but can be read as a stand alone. Why did I read this book: I love this series so much. Take a look at the previous reviews: All Our Pretty Songs (book #1) and Dirty Wings (book #2). 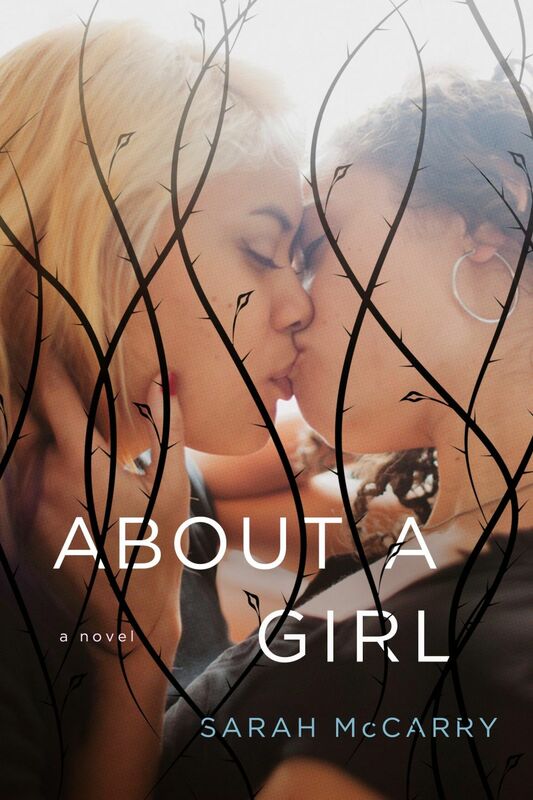 About a Girl is the third novel in Sarah McCarry’s breathtaking Metamorphoses series of awesome Greek retellings that centres its stories on girls. I say Greek retelling in a loose way – there isn’t a definite, clear-cut retelling of any one particular myth here. Rather, this series delve deep into that kind mythology building that pays homage by subverting and transforming, by creating an ever-changing landscape featuring young people as they change themselves. Sometimes they do that under the looming threat of a Greek personage. Sometimes they travel to the underworld. Sometimes they eat pomegranate seeds. Sometimes they fall in love with murderous witches. I talked about my love for Sarah McCarry’s girls before. How they are very human and allowed to make mistakes, to grow, to experience, to try and to fail, to just be. Sometimes they are part monster too. Tally is sure of everything. Her world is ordered. She knows exactly what she wants from life: to go to college and be an astronomer, a Nobel prize-winning one. She knows she is loved by her family and by her best friend Shane. She knows she doesn’t care – or at least have most definitely one hundred percent come to terms with– that her mother left her as soon as she was born and she never knew her or her father. Then what was once a life of order and certainty becomes messy and surprising. First, Tally falls in love and in lust with Shane. She can’t believe she is victim of pesky teenage hormones after all. Confusion and uncertainty follow and that is exactly the right time for Mysterious Forces to approach Tally with tasty morsels about her unknown father and her long-last mother. The story follows Tally, in this brief moment of time as she goes on a Quest to find her father, only to find a mother she thought she didn’t care about. On the way, she gets lost. She loses all sense of time and place. She behaves completely unlike the image she has of herself. She falls in love. One thing I love about this book: Tally asks if it is ok to be in love with two people at the same time: one of them a trans boy and the other, a girl. The story, the narrative, the characters are all like: sure. Because of course. When Odysseus is coming back from Troy he gets lost. He goes on Quests. He gets trapped in a place having an affair. Tally ends up in a town where recalcitrant immortals go to forget. She too gets trapped there, with fuzzy memories, and confused sense of time and the certainty she is falling in love – and in lust, so much lust – with Maddy. Maddy, who also wants to forget, except her past is way more complicated. Sarah McCarry wrote about Maddy – under her other name, Medea – and how there are ways to think about her. I am thinking of her still. In many ways, this is Tally’s own Odyssey. Tally is deconstructed and put back together throughout the journey of a lifetime. Everything she thought of herself is questioned but not exactly overturned. This is another thing I loved about this book. It broke me then put me back together. It also made me laugh a lot, which considering the tone of the review, might come as a surprise. It surprised me too, for About a Girl is actually very funny in tone at least to start with. And to end with. The middle is mysterious and heady and sensual. The journey in those books and with those books has been epic. I am very sorry to see it end and I will miss Sarah McCarry’s girls very much indeed.